When I was a kid and faithful reader of the Seattle P.I. (comics section), my grandmother encouraged me to draw a picture for "Mr. Doughnut." This was a column for kids which featured drawing tips. 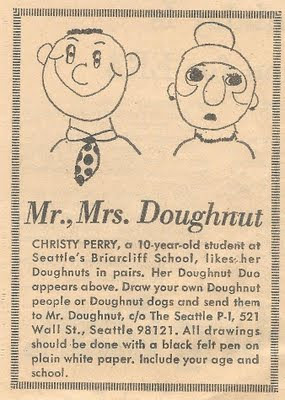 My drawing of Mr. and Mrs. Doughnut was the first thing I ever got published, and my grandmother proudly bought several newspaper copies and sent the clippings to all our family. Write about doughnuts, or doughnut people. Or draw 'em.